Recently Sandra Herbst and I were working with a group of people online who had questions about co-constructing criteria with students. 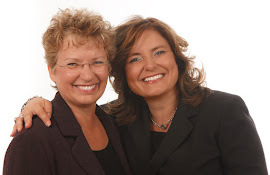 The ideas are extensions of ideas you can find in Setting and Using Criteria - a best selling book I wrote with Kathleen Gregory and Caren Cameron. After the web conference Sandra and I discussed how helpful this information would be to teachers and others interested in learning about more ways to engage learners using assessment. So here it is! Access this entire 15 minute mini-seminar free when you sign in to our membership site. 1. Involve students in shaping the learning community of the classroom. For example, “What is important so this is a class where we can all learn and grow together?” List their ideas. Accept all ideas. It shows respect and that student’s opinions, no matter how different they are from yours, are valued. This is the first step to co-constructing criteria. I suggest you leave this as a list for the first week or two. Periodically ask students what else is important so this is a class where we can all learn and grow together. As Stephen Covey suggests, this is a powerful way to “Seek to understand before seeking to be understood.” It is so much more powerful than a teacher posting ‘Class Rules’ that some students translate as, ‘It’s my way or you’re out.’ Now students can be involved as they self-monitor their contributions to the classroom community. 2. Invite students to show you HOW they are smart. Building on Howard Gardner’s work, have students identify their expertise – in or out of school. This is a unique kind of baseline data that helps students help you to better understand how they might show proof of learning in your class. Some teachers have students post mini “Expert Sheets”. Students brainstorm different kinds of expertise like: Mathematics, long boarders, video gaming, running, and so on… it can be about in or out of school. Each kind of expertise becomes a title on a letter-sized piece of paper. Once all the ‘expert sheets’ are completed have students post them around the room. Then, ask students to sign up for all the kind of expertise they currently have. Then, these sheets can act as a “go to” place when people need help. Now students can be involved as they find ways to prove to you that they are learning. 3. Ask students to describe the best class and the best teacher they have ever had (no names please). This can be done individually in a journal or email to you. Or, it can be a brainstormed list that will be posted in the classroom. This helps you understand what students’ value and appreciate. It will also help when you model self-assessment. You can go to the lists and explain to the students what you think two of your strengths are and what evidence you have. Then you can talk about one thing you are working on to become a better teacher. Do this periodically so students understand that you also do what you are asking them to do. Now you have begun to set students up to communicate to you their ongoing learning strengths and challenges. This can save you time while having students more engaged and learning. Over the coming weeks I will share more ways you can have students working harder than you are by using assessment in the service of learning. As you completed Step 2 and created your evaluation plan, the evidence collection becomes clear. Since you need valid and reliable evidence of learning it is important to collect the evidence of learning over time from multiple sources (products, observations, conversations). It also supports student learning if they have responsibility for collecting some the evidence. Getting students involves is easier than it sounds. Consider the Science example shared in Step 1. Consider the ways students can be supported to collect and file the products - in a digital file folder or a paper-based one. A crate or part of a file drawer can keep the evidence safe as the learning time unfolds. Now you can make observations as students engage in being scientists day-by-day in your classroom. Select a few students to observe each day and then take a few seconds to use a highlighter pen to note what you have observed. As the term progresses your ongoing observations provide you with the data – the evidence of learning – you need to evaluate the parts of the curriculum that are not evident in products. Because you've take a few minutes every week to record what you have witnessed students actually doing, you can look at the pattern and trend over the term. You can speak confidently to what students are able to consistently and independently do as scientists. Everything else you need to have “proof” is present in the products students have been collected. This is one way to have the evidence you need to evaluate when the end of the term arrives as well as having students engaged in providing evidence of their own learning to you. I hope your new school year has a great beginning! I find that teachers tend to be optimists – a new beginning is a time full of hopes and dreams. At least it always is for me. Getting ready for the school year is an important part of making this the best year yet. I've identified six steps to being ready for the new school year from an assessment perspective - after all, as Black and Wiliam (1998) and other researchers note, powerful research-based assessment practices have the ‘greatest impact on student learning ever documented.' The first step I identified in an earlier blog is being clear about what needs to be learned. Step Two is thinking about and planning for evaluation (often evaluation is the “end” teachers have in mind and plan to share with students as part of being open and transparent). Preparing for evaluation means thinking about what reliable and valid evidence of learning might be. As we prepare for a new year, reflect back to the first two steps: what students need to learn and what evidence of learning you will need to make an informed professional judgment (evaluation). Then you are ready for Step Three: Preparing to collect baseline evidence of learning. Think about the kind of evidence your students will need to produce in order that you can evaluate their learning at the end of the term. What would you have students create, do, and articulate in order to provide evidence of where they are at this point in time while it is still early days in the term. Make a plan to collect a few key pieces - not too many! You just need enough to inform your general understanding of what students know, can do and can articulate. And later, students (and their parents) will need enough to provide a powerful "lightbulb" moment as they see visual and concrete evidence of their growth and improvement over time. Notice, with the baseline samples in these examples, teachers can adjust their instruction based on current information. Students now have a first attempt – a baseline sample – that they will be able to use to help show themselves, their teachers, and others the progress they have made as they have learned during the term. As I finalize this draft, I think about the crisp edge to the morning air when I woke up today. It is still summer here but autumn is making itself felt. A new school year is getting closer. Happy play time! It is still summer here in the northern hemisphere:-) Enjoy your moments. We evaluate what we value. Step 2 in Getting Ready for the New School Year is to plan the evaluation process. Teachers are prepared to evaluate well. Leaders know how to better engage in the evaluation process themselves. Part of the process I will highlight in this post has to do with looking at the learning destination and thinking about what needs to be VALUED. 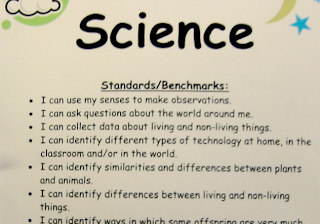 Consider a Science example from a primary classroom. This teacher need to keep track of what students create, what they do, and what they say in relation to the learning destination. -collect data about living and non-living things? And the list continues. Each statement is a question that leads to what needs to be valued and helps teachers consider what could be possible evidence. Large-scale assessments would give a series of paper and pencil or online tasks. In Classroom Assessment we collect evidence in relation to the learning destination from multiple sources over time to ensure our findings are reliable and valid. This is a process called TRIANGULATION. It is essential when it comes to classroom assessment. (To read more go to Making Classroom Assessment Work - Chapter 5). When we only value PRODUCTS (tests, quizzes, culminating assignments), we can put ourselves at professional risk because the learning outcomes/standards also include PROCESS, and require students to ARTICULATE their learning to others. 1. What evidence of learning will students create as they engage in the rich learning tasks in relation to the learning outcomes/standards? 2. What evidence of learning will you as the teacher collect and track so you have the evidence you need in relation to the learning destination for the first reporting period? This is part of the process participants in our August events in Comox and Toronto will engage in. We will be working with great groups - feel free to register or call 1 800 603 9888 so you can join Sandra and me. 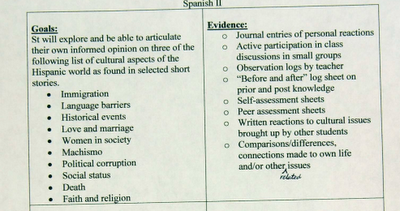 Consider this example from a high school Spanish class. Notice the teacher has listed the possible evidence of learning. 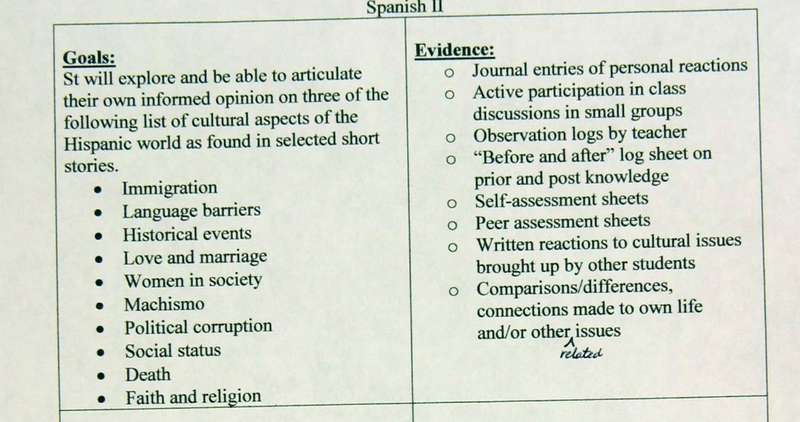 Notice the teacher is deliberately collecting products, observations, and records of conversations (journals, notes, and so on) so the evidence is from multiple sources over time. 1. What evidence will students be creating? 2. What evidence could the teacher choose to track and collect? 3. Is the teacher preparing to evaluate what is valued as defined by the outcomes/standards? Lastly, before you finalize your evaluation plans, you need to know the 'rules and regulations' around reporting so you are ready to use the symbols required by your report card. Contact the principal or the school district office to find out about the current policies, rules, and regulations. Don't operate on the basis of rumour. Report cards are legal documents and they need to be done correctly. Don't place yourself at professional risk. Step Three will be posted in the next few days. John Hattie Interview - Worth Viewing!